You’re all packed and ready to go. You have your boarding passes in hand, and your kids are wired. Everyone is excited get to the theme parks. Your hotel room is waiting for you and you’re just walking out the door. Don’t arrive without knowing this stuff ahead of time! 10. It rains. A lot. In the summer, it rains nearly every day in Central Florida. Make sure to have a pair of waterproof shoes if you can, a lot of areas in the theme parks become a lake. (Tomorrowland, I’m looking at you.) If you’re not ready for it, your awesome day at the park can turn into a mad dash back to the hotel. Many guests leave when it rains, but that’s the best time to go do things. A lot of attractions are indoors. Most attractions can be enjoyed rain or shine. Wait times take a dive right after the weather clears up because most guests leave when it stops raining. 9. There are no cheap tickets. If you’re looking for discounted tickets once you get here, that ship has sailed. There are a couple of places online where you can buy them at a very slight discount ($3-$5 off). There are package deals, and there can be specials offered directly from the source. The best way to save money is to stay longer. The difference per day of going to Disney for one day or five is nearly $50! There’s no quicker way to ruin a good day at the parks than for someone in your party to pass out. Dehydration is a real thing, and it happens a lot more than you would expect. The heat and humidity can play tricks on your senses. Before you know it, you’re tired and want to have a seat. Every place that sells fountain drinks will give you ice water in a cup for free. If you don’t want to tote around your water bottle, you don’t have to. The theme parks are just as worried about your health, and they offer water for free to everyone. You would think that this in a no-brainer. When you’re visiting anywhere near the equator, you should wear some sun block. If your kids plan on swimming while it’s still light outside, then it’s probably a good idea to get some waterproof sun block. Check out sunburnmap.com just to see what kind of UV rays you’ll be dealing with before you get here. The winter months aren’t as bad as the summer months, but you can get a sunburn any time of the year. Be sure to pack some in your checked luggage because the resorts know that you need it, and they will charge an arm and a leg for even a small bottle. 6. Pressed for time? Skip the Lines! If you’re visiting for only a few days, then it’s best to maximize your time while you’re visiting the parks. Disney and Universal each offer their unique ways of preventing you from wasting your time waiting in line. At Walt Disney World theme parks, they offer a free service called FastPass. If you bought tickets ahead of time, then you can take advantage of FastPass+. Thirty days before your day of arrival you can reserve a time to visit select rides and attractions. If you’re staying at a Walt Disney World resort, you get 30 extra days and can book 60 days before your visit. Scheduling ahead is possible through My Disney Experience and the My Disney Experience Apps. At Universal Orlando Resort, they offer a paid service called Express Pass. At any time, you can show up to the Express Pass sign in front of select attractions, and they will scan your passes and let you into a line with a shorter wait. This is a must if you expect to experience all of Harry Potter and the rest of Universal Orlando in one day. 5. Traveling with small kids? Don’t worry. If one of your children is too small to go on a ride that the rest if your party interested in, you still might have a chance. Did you know that you can take turns going on rides with your kids? Many attractions offer a “child swap” area so a parent can wait with one child while your other child goes on the ride. Each time that smaller child waits for the rest of the group to ride, they need only one adult to stay with them. Child swap offers an opportunity for the rest of the group to ride twice. 4. You don’t have to carry your merchandise around the park. Nearly every theme park offers a merchandise pickup option. Universal and Disney even offer resort delivery if you’re staying on-site! Just purchase items and let the cashier know you would like the items delivered to your hotel. They’ll ask the room number and confirm your packages will arrive before you check out. Ordered items show up during the next day, sometimes earlier. Disney now offers a Shop Disney Parks app that allows you to order merchandise and have it available for pick up when you leave the park or straight to your hotel room. You don’t even have to buy it in person! 3. Staying on-site? Use Early Park Access. Both Universal and Disney offer a form of accessing the park before the general public. Universal offers early admission to the Wizarding World of Harry Potter when staying at select on-site hotels. If you want to ride Gringotts or Forbidden Journey without waiting hours on end, this is your chance! Disney offers Extra Magic Hours that give on-site guests extra time in the parks. The schedule is different each day, so check the calendar to see what’s available during your stay. Sometimes they offer evening Extra Magic Hours that lets you continue your fun after the park is closed. 2. Don’t Forget Your Swimsuit! With the heat and humidity topping out in the summer months, you’ll want to cool off. Whether it’s at a water park or a swimming pool, there are plenty of places to check out. Nearly every hotel in the Orlando area has a swimming pool. 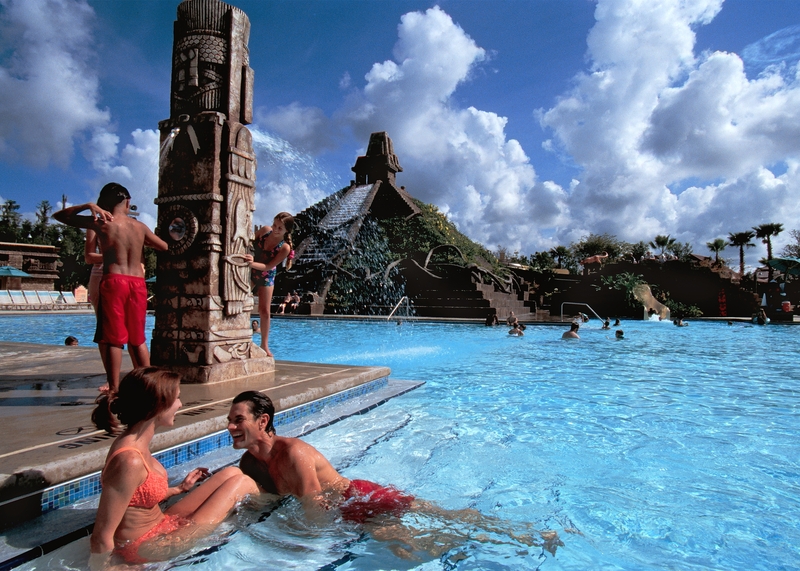 Most Disney and Universal resorts have a kids play area and swimming pools beyond compare. You can make a day of it, or relax by the pool while your kids go wild. 1. Plan Ahead, but don’t stress out. With a lot riding on your Orlando vacation, it can be hard not to be consumed by planning. A lot of scheduling can be done ahead of time to maximize your fun while on vacation. Just make sure to keep in mind that this is a vacation. Patience is one thing you’re going to need to have fun. Schedule a lot of free time around what you want to get done. Also, make sure to have realistic expectations. Some people try to cram a park like the Magic Kingdom into one day. If you want to fully enjoy what there is to offer and have fun at the same time, then it’s probably not going to happen. Check the park maps before you arrive so you can see where things are ahead of time. Have your kids mark off what they want to see and sprinkle in a lot of free time. Popular attractions at Disney and Universal can average over a 70-minute wait. What do you do when planning on coming to Orlando? Let us know in the comments below.